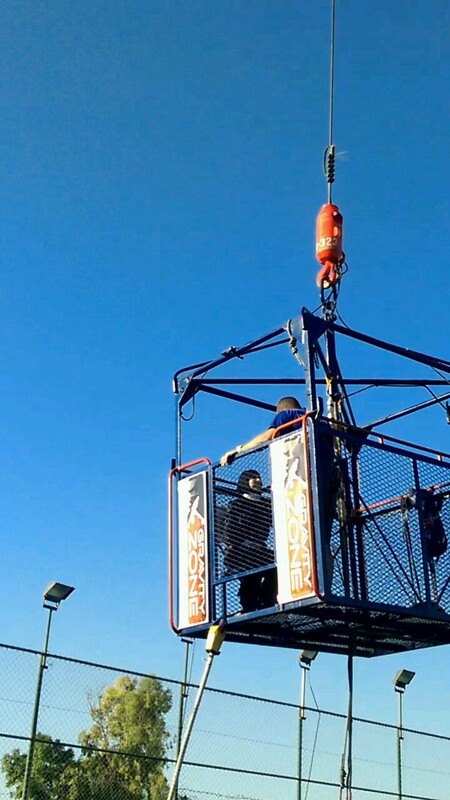 We would like to thank Gravity Zone for offering us an opportunity to experience and review the Bungee Jumping. 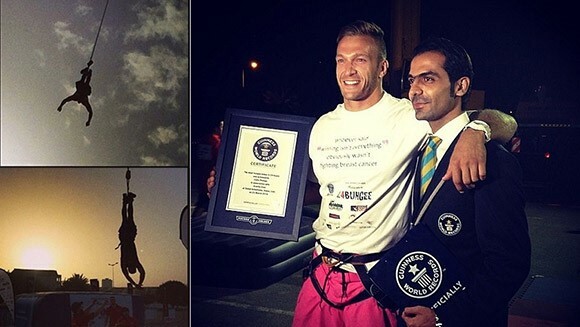 Gravity Zone is the only place in the entire Middle East which provides bungee jumping services and has even helped a Dubai resident in winning a Guinness record for most consecutive jumps in 24 hours. 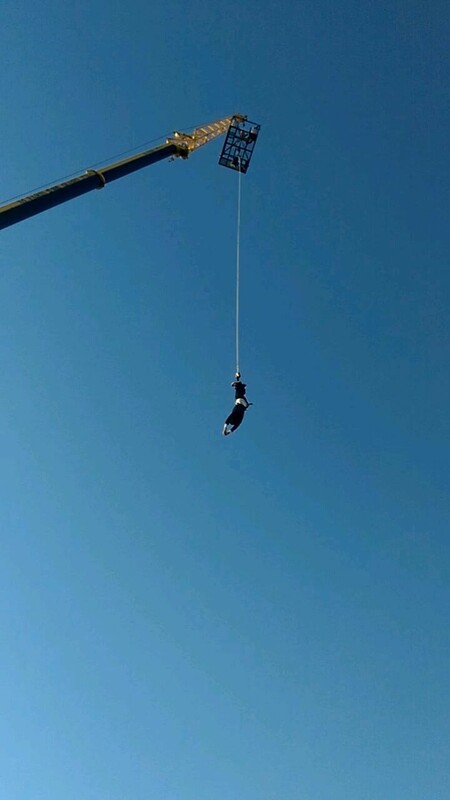 I didn’t even know bungee jumping existed in Dubai and when I did find out, I got so excited to try it out! Here is Colin Phillips with his Guinness Record. The location was fairly easy to reach – it was opposite Dubai Bowling Centre on Sheikh Zayed Road, just before the gas station; however the turn which leads to Power Play was marked “private entrance” and in no way denoted that it led to the location, so I ended up circling the area twice before finally heading down the “private entrance”. 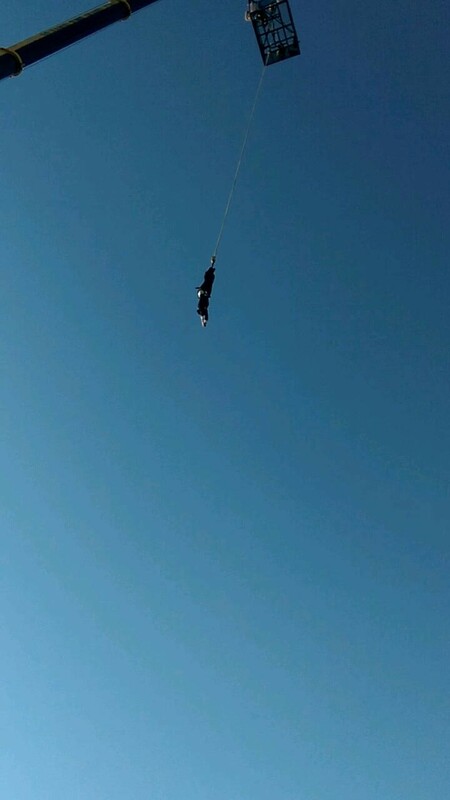 I was a little surprised at reaching the venue and not being able to find a reception; a little confused but I made my way to a shaded area and talked to the lady there about bungee jumping and she directed me to the person in charge and handed me a consent form. From then on, things ran very smoothly. 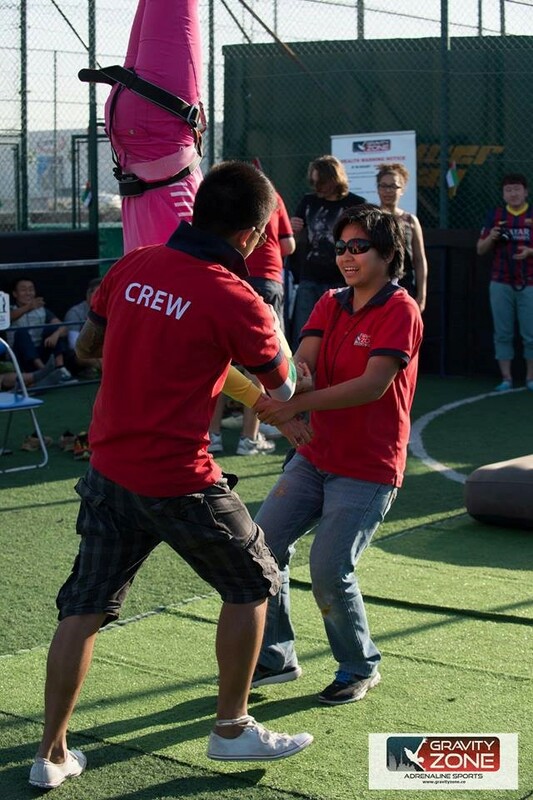 The Gravity Zone crew are amazing at dealing with people! They ask you questions if it’s your first time and ease you into the entire process; honestly, I just felt very excited, a little nervous but not scared at all. 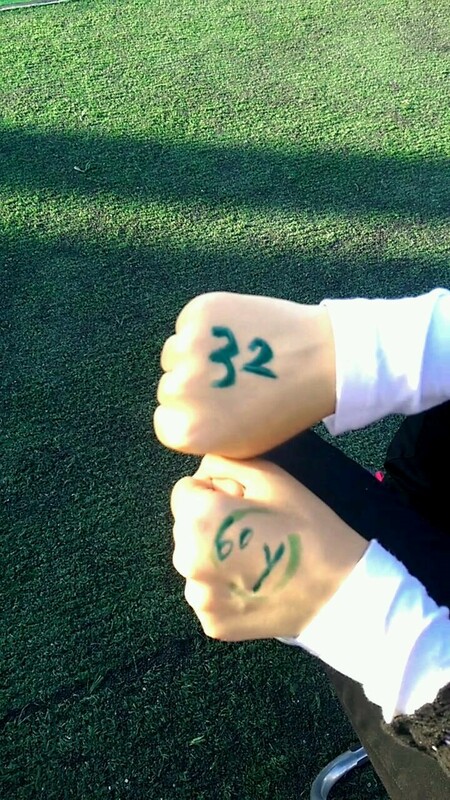 They weighed me and wrote the number on the back of my hand, along with a participant (or jumper) number and then walked me to the jump area. I’m 60kg and the 32nd jumper! At the jump area, each of us had to wear safety harness belts and were constantly asked about any jewellery we may be wearing or if we had anything in our pockets – these need to be removed for safety reasons. Mickey, one of the crew members, was absolutely thorough in terms of safety; she literally made sure of everything about 3 times! I was probably asked more often than others since I wear a headscarf and jewellery I wear would not be apparent to others. 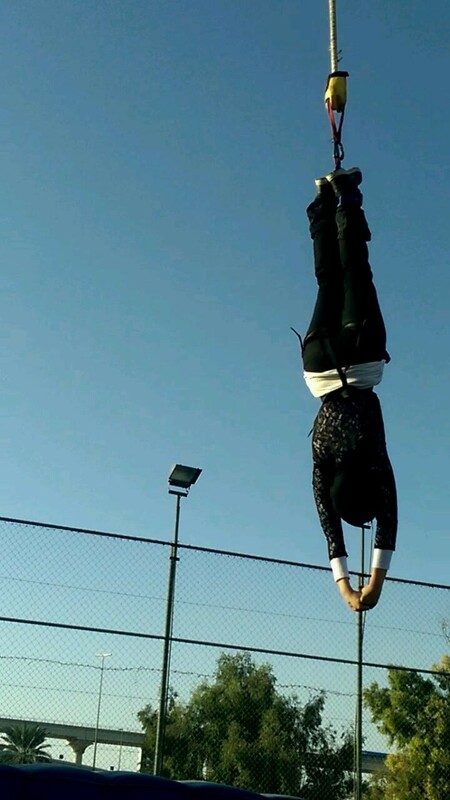 Note that if you do wear a headscarf and plan on going bungee jumping, don’t use any pins! Here’s mickey (right) helping a jumper get down onto a mattress. Since your legs are bind together, you tend to bunny hop towards the cage which takes you up. Once inside, the jump master – Tommy – introduced himself, took a picture with me and started talking about how the whole thing works. I think the only thing I was worried about was my headscarf flying off so Tommy asked me to tuck that into my shirt. He was being cautious about safety while Mickey strapped my bungee cord to the cage. As the cage ascended up higher, he conversed about what I should or should not do before my jump, where I should look, etc. ; I think talking to him distracted my mind from feeling anxious and the fear factor only hit me when I was 164 feet above ground, staring at the Dubai skyline. Tommy counted down 3…2…1…and then I plunged! Initially it felt like I had just jumped into air and my body panicked and I screamed, but within a second or two the cord pulled back and I realized that I’m alive – then I burst into laughter mid-air! It was exhilarating and the butterflies kept rushing inside me with every light bounce and sway of the cord. Gradually, I was lowered towards the ground and was placed on an airbed. I was asked about my experience and had a picture taken. It was beyond amazing and my head felt slightly “floaty” afterwards.